Note: We do not condone or belong to any Neo-Nazi group anywhere worldwide. 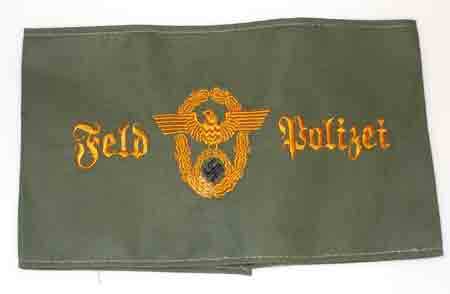 Our German items are meant for the serious collector or reenactor. All items on this page are reproductions, unless otherwise indicated. SS Eagles $16. Army Eagles $16. Police Eagle, see photo to right. Helmet emblems $5 each pair. Collar tabs $25/pair. Oberschuetze rank stars, black (top) $8, green (bottom) $8; Gefreiter chevron $16. GD veterans patch $20. All award badges in this photo $15. Top row, left to right: Destroyer's regular, Destroyer's silver, U-boot bronze, U-boot silver. 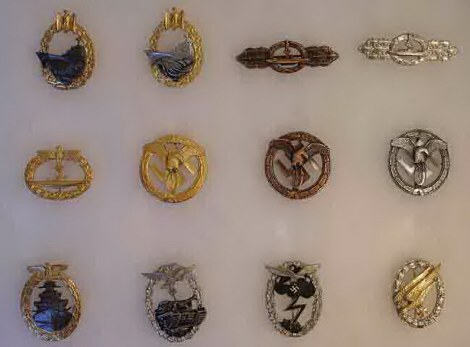 Middle row, l - r: U-boot Captain's, Driver's gold, Driver's bronze, Driver's silver. 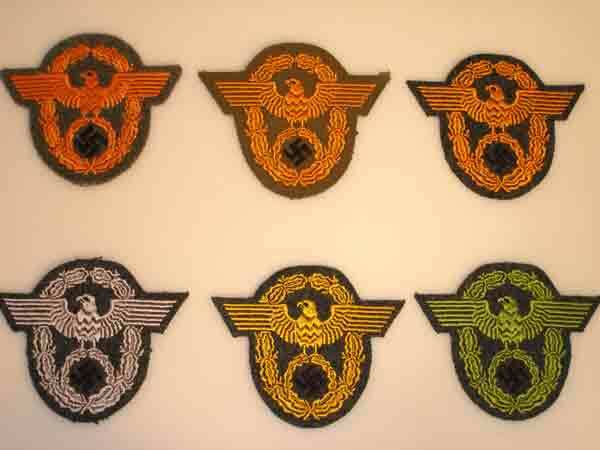 Bottom row, l - r: High Seas Fleet, Luftwaffe Panzer, Luftwaffe Ground Assault, Fallschirmjaeger. 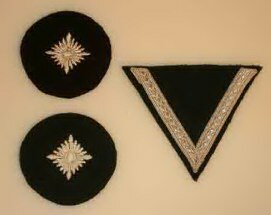 Column 1 (furthest left, top to bottom): General Assault Badge, Anti-partisan, Army Flak, Infantry Assault Badge. 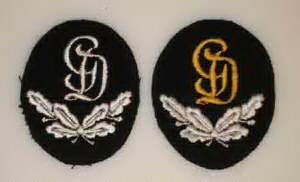 Column 2: Wound Badge Gold, Wound Badge Silver, Wound Badge Black, Assassination Plot Wound Badge. Column 3: Panzer Assault Bronze, Panzer Assault 50, Panzer Assault Silver. All Medals in this photo are $20 each, except where noted. 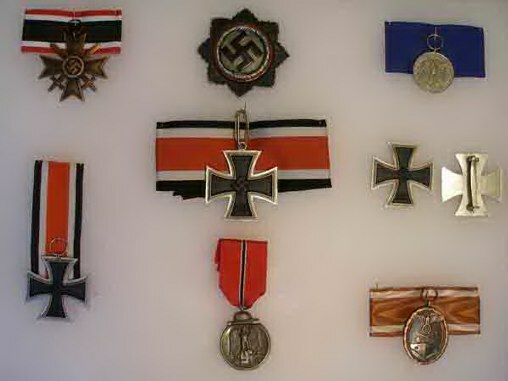 Column 1 (furthest left, top to bottom): War Merit Cross Bronze with Ribbon, Iron Cross Second Class. Column 2: German Cross ($35), Knight's Cross with Ribbon, Eastern Front with Ribbon. 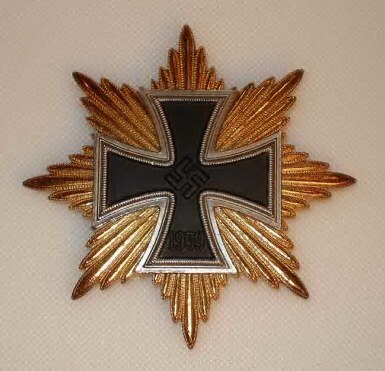 Star of the Iron Cross, never issued, $40. All medals on this photo are $15, except for the BMW with the Motorcycle in it, which is $30. 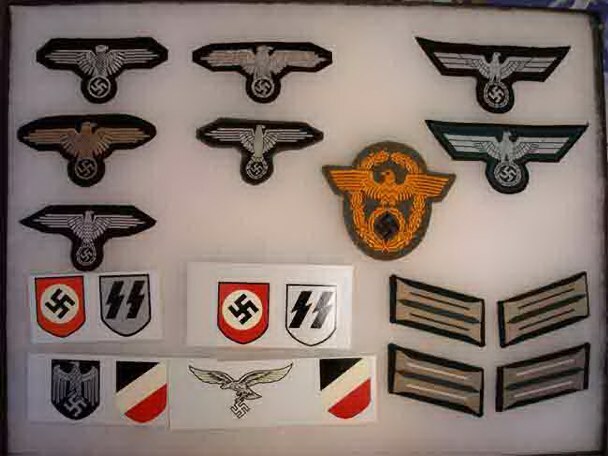 Top row (l - r): Sturmtrupp, SS My Honor is Loyalty, WWI Sturmtrupp, Totenkopf, SS White on Black. 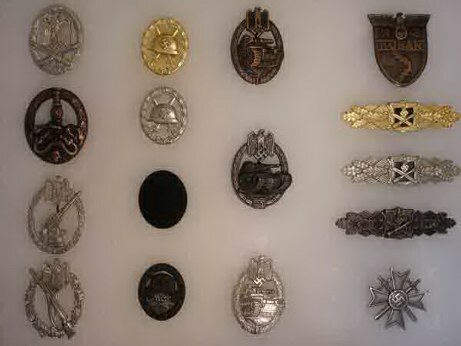 Middle row: VW large, VW small, Gestapo ID disc, WWI Pilot's Award, WWI Tanker's Award, Party Badge. 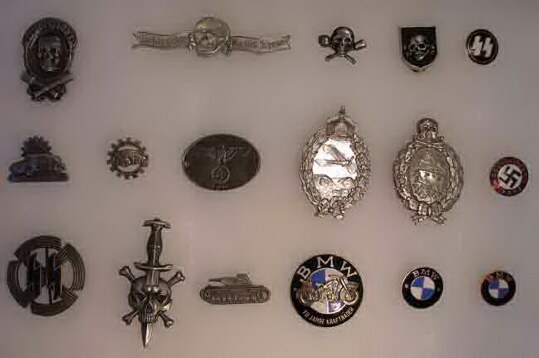 Bottom row: Germanic Proficiency Runes badge, Death's Head with Dagger (fantasy), Tank Destruction Pin, BMW with Motorcycle, Old BMW silver pin, Old BMW copper pin. German Cross in Silver (l.) and in Gold (r.), $35 each.